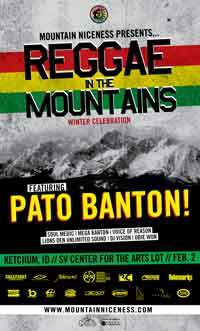 Bundle up and put on your party boots for Reggae in the Mountains featuring Pato Banton on Saturday, Feb. 2, at the Simplot lot across from the Ketchum Post Office, presented by Mountain Niceness Productions. The show will kick off at 7 p.m. with opening bands to include Soulmedic, Mega Baton and Voice of Reason. Tickets are $20 until Feb. 2 and $25 at the gate. VIP—Very Irie People—access to Reggae in the Mountains VIP sponsor’s tent is $100. The evening promises to be great fun with bonfires, bars, food and excellent reggae and roots music. This Reggae in the Mountains is also a celebration for the end of the Boulder Mountain Tour, which will cap a week of Nordic skiing, activities, education and fun at the 2013 Sun Valley Nordic Fest, Jan. 26 through Feb. 3. When the show outside is over, head to Whiskey Jacques’ in Ketchum for the after party with dancehall reggae music at 10:30 p.m. with full sets by Mega Banton from Jamaica, Soul Medic from Hawaii and California, Obie Won from Ohio, Lions Den Sound Unlimited from California and DJ Vision from California. Cover charge at Whiskey’s will be $8. For details and to buy tickets, stop by Atkinsons’ Markets, Johnny G’s Subshack, Backwoods Mountain Sports or Zenergy at Thundersprings, or visit http://tickets.frontgatetickets.com or www.reggaeinthemountains.com. For updates, follow Reggae in the Mountains on Facebook. Proceeds from the bar sales will benefit the Idaho Social Learning Center’s scholarship fund. Sponsorships opportunities are also available. For inquires, email Danny Walton at iriedonal@hotmail.com or call 720-5431.